I hear a lot of people, myself included, talking about needing more balance. The assumption being that if I were living a balanced life, I’d be able to roll with the punches, or I’d know how to say, “No” better, or I’d be healthier physically and emotionally. If only my life were in balance, I’d have …. You fill in the blank. If only, if only. What if I am coming at this balance thing all wrong? What if I don’t achieve balance first and then all those other things fall into place? What if I invite in those other things, no matter how imperfectly, and then find: Hey, balance must be present because I am living into the thing I need most right now in this moment. What would that be like? I can’t help but think that balance has something to do with nimbleness and perception. I’ve got to be quick to notice those states of balance because life is going to immediately throw something else my way that won’t feel or look like balance at all and I’ll need to adjust once again. Every lunar cycle invites us to make better friends with the sign of the New Moon. Seasonally, energetically, it is an opportune moment to pay more attention to those qualities represented by that sign. Some lunar cycles sneak by with little attention needing to be paid about Getting It Right. This month, not so much. Libra is holding up those scales and taunting me with the notion of Balance, forcing me to lust for that state of nimble perception where I get to feel, however briefly, the delightful sense of being able to change, adapt, and adjust when needed. In the Northern Hemisphere, Libra is the season of moving into darkness. This is another adjustment we need to make, another reason to examine balance. Questions about survival arise when we know the growing season is ending. How do we get ready? Uncertainty in the world, showing up in a variety of ways right now, increases this sense of needing to be on guard, needing to find the balance that says we are going to be OK. During this lunar cycle, uncertainty is mirrored in astral events: Mercury begins a retrograde journey in an even darker sign—Scorpio, a lunar eclipse at the Full Moon on October 18th, and the fourth of seven exact squares between Uranus and Pluto happens on November 1. These things can catch us off guard. I invite you to make a list of what your life would be like if you lived in a state of balance. Make room for those things. Congratulate yourself when you notice those fleeting moments when balance is present, and forgive yourself when they aren’t. Balance is motion, presence, and surrender. May we fall into that grace. Sunday, October 13. Communication would be a piece of cake if it didn’t have to involve other people. We may be seriously frustrated about communication today. Sometimes our thoughts move much faster than our hearts. We need to adjust the signals between what we think should be happening and what is happening on the emotional level. If you are feeling stuck emotionally, find a way to get a new perspective on things. A friend could give you a fresh point of view. Monday, October 14. Outbursts of temper or unexpected reactions create a desire to turn off the noise. When the Moon moves into Pisces this afternoon (in CDT) notice your patterns around soothing discordant feelings. The temptation may be to numb out. Not a bad choice, but is there something that will help you achieve the balance of quiet and calm without disappearing altogether? Saturn moves into a new part of Scorpio today, signaling new work in the realm of understanding our deepest feelings. October 15—Gibbous Moon: Perfecting. Let’s look for the middle ground between impossible expectations and just giving up altogether. Where does that balance live in you? During the Gibbous phase of the Moon we find ourselves immersed in the work of becoming. The seed of the New Moon is ready to blossom. This can feel great or like a lot of pressure (or both). Notice where you are. Mars moves into Virgo, a sign of high expectations, but also a sign of moderate steps. Can you baby-step your way into a state of balance? A large part of the adjustment is to acknowledge our hearts. Hopes and wounds are near the surface so don’t give up if that feels overwhelming. Take advantage of quiet moments where you can get in touch with a state of grace. If you can’t find those moments, that is telling you something about where you need to find more balance. Wednesday, October 16. The next two days will be more dramatic, so take advantage of the Pisces Moon respite for most of today. Venus contacts both Uranus and Chiron; feelings could be all over the map with a mix of confidence and vulnerability coming to the fore in relationships. Thursday, October 17. Now that the Moon is in Aries, we really get to test our progress in choosing response over reaction. Both balance and relationship require us to develop the skill of responsiveness. Aries is a fire sign that sometimes acts first and thinks later. The Aries gift is one of spontaneous acts of unintended courage. Even after a fall, Aries gets up and tries again. However, this gift becomes a challenge for anyone who wants to pay attention to the subtleties of balance. The give and take between Aries and Libra is the primary negotiation in every relationship—the balance between self and other. We get to practice this dance today. The Moon adds oomph to the tense square between Uranus and Pluto. Don’t be surprised by impatience, frustration, and outbursts of anger. However, the Moon trines Venus as well. There is a desire to work it out. Perhaps the best thing to do is to acknowledge everyone’s individuality and go from there. 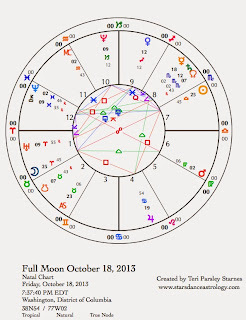 October 18—Full Moon: Illuminating. Lunar Eclipse. It may be time to press the restart button if things are off track. That’s the beautiful thing about an eclipse—whether we like it or not, something about the old paradigm has suddenly shifted. We see with new eyes. What old ideas about balance and relationship no longer apply? What brand new adjustments will you need to make now? 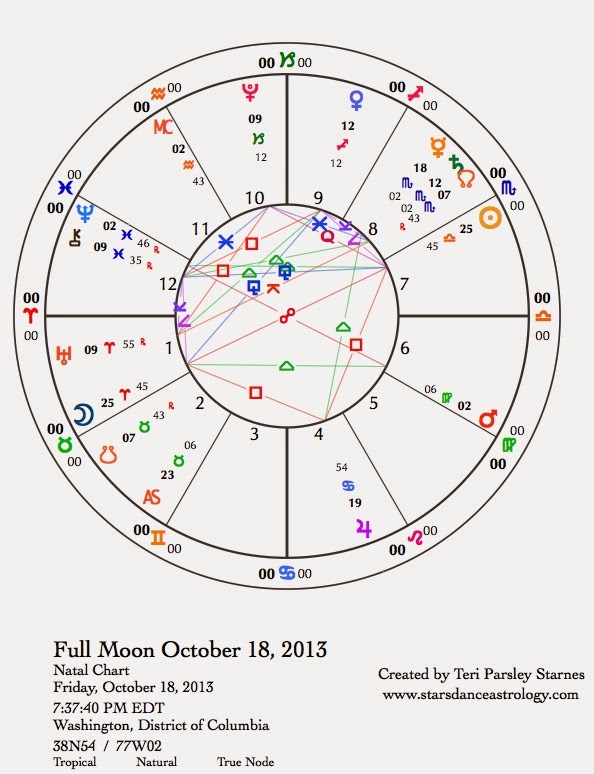 The chart for the Full Moon shows Jupiter in Cancer squaring the opposition between the Sun and Moon. If an opposition is about integrating the two extremes (Libra relationship and Aries individuality), then a planet in square to these extremes will challenge our ability to find synthesis. The reason a Full Moon can be so illuminating is that we have the opportunity to integrate pieces of ourselves that have previously felt alienated. While we are working on balance and responsiveness we come to find that we need to also make room for individuation and certain amount of risk taking. Jupiter says, “Wait a minute, I don’t feel comfortable with this much change. Where’s my security? What do I have to do to make sure we are all safe?” On the cusp of finding the grace of balance, we are challenged by big waves of fear and reaction. Good practice! There is another opposition in this chart—Mars in Virgo opposite Neptune in Pisces. Mars in this sign is the champion of order and service. Neptune is the god of surrender and salvation. We are offered a chance to use both discernment and faith to create a new synthesis. Our work ahead. The approaching square between Uranus and Pluto (exact on November 1) is consistently reminding us that the world is changing dramatically and quickly. This is a major test to finding balance. Mercury in Scorpio is stationary (will station retrograde on October 21). Although this transit is far less rare than the Uranus/Pluto square, it is no less significant in our task of finding balance. We work on communication. We see the flaws in our systems. We learn how to adjust. Saturday, October 19. The Moon in Taurus has a calming influence. Take pleasure in your senses. Enjoy comforts and beauty. Everything is unfolding as it should. We get an infusion of patience. The opposition between Mars and Neptune is exact today. Take a little time to dream and a little time to organize your life. The balance will feel delightful.